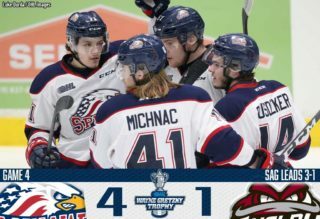 Saginaw, Michigan – The Saginaw Spirit hosted the Guelph Storm for the second meeting of the season on Saturday evening for First Responders Night at The Dow Event Center. 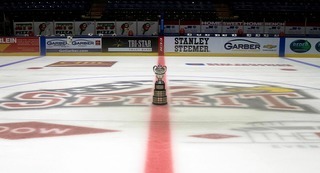 After surrendering a 3-2 advantage in the third, the Spirit forced overtime and eventually evened the season series with the Storm in a 5-4 shootout win. The Spirit struck first on the power play when New York Islanders prospect Blade Jenkins scored just 3:20 into the game on the power play. After a Nicholas Porco slap shot from the top of the right circle, a rebound shot left towards to the top of the slot that Jenkins lifted over the sliding goaltenders’ pad. 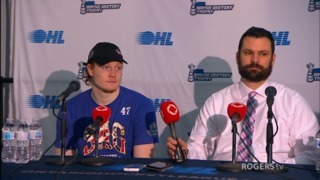 The goal was the third of the season for the Jackson, Michigan native snapping a six-goal goalless drought. Arizona Coyotes prospect Ivan Prosvetov came up with several saves to during the Guelph power play midway through the period. The biggest came in the waning seconds of the powerplay when Liam Hawel took a one-timer from the top of the left circle that Prosvetov denied with a sliding blocker save. With just two seconds remaining in the first period, the Storm evened the score on a five-on-three power play. Arizona Coyotes prospect Nate Schnarr took a shot from the top of the left circle that beat Spirit goaltender Prosvetov top shelf. San Jose Sharks first round pick Ryan Merkley and Montreal Canadiens prospect Cam Hillis combined for the assists on the play. The two teams entered the first intermission tied, 1-1. Prosvetov continued his strong play in the second frame. The Russian goaltender kept the game tied six minutes into the period when Guelph’s Domenico Commisso took a shot point-blank on a two-on-one rush. Saginaw’s Camaryn Baber scored his first goal of the season with just over eight minutes remaining in the second period. Baber received a drop pass from Ryan Stepien and scored on a wrist shot that beat Guelph goaltender Nico Daws five hole. Just over a minute later in the period, Guelph’s Zach Poirier ties the game with a deflection in front of the net. Merkley took a wrist shot from the left point that Poirier deflected down into the net. Saginaw regained the lead just 1:22 later, after Cole Coskey slid in a rebound from a Hayden Davis shot from the right point. Coskey pulled the puck around the goalie and tucked it into the open Guelph net. Saginaw’s leading scorerAlbert Michnac contributed the secondary assist on the play. Saginaw took the one goal lead into the second intermission. Guelph tied the game off a redirected shot with just under 12 minutes into the third period, 3-3. Ryan Merkley took a shot from the point that Zach Poirier defected up into the Saginaw net for the overager’s second goal of the game. Domenico Commisso gave Guelph their first lead of the game with just under five minutes remaining in regulation. Commisso received a nice pass from Ryan Merkley to the left of the goal and shot the puck into the open side of the net. The assist was Merkley’s fourth of the game. With under four minutes remaining in regulation, Saginaw’s Reagan O’Gradyscored his first goal in a Spirit uniform to tie the game. O’Grady made a nice move into the Guelph zone and took a wrist shot from the top of the right circle that beat the goaltender above the blocker. Ivan Prosvetov was strong in overtime and overcame an early Guelph power play to keep the game tied, heading into the shootout. Saginaw outshot Guelph, 31-22 after regulation and overtime. 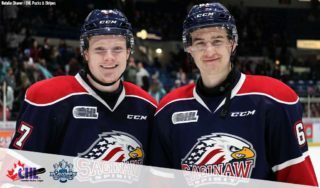 The shootout took six rounds before either team could beat the goaltenders when Saginaw’s Mason Millman took a shot from the right faceoff dot that beat Daws giving the Spirit the win, 5-4. The Spirit take on the Ottawa 67’s for Nexteer Robotics Night Sunday, October 4. There will be a High School Robotics presentation in the Budweiser Red Room beginning at 4:00 p.m. with puck drop at 5:30 p.m. The game will be the first of two meetings against Ottawa this season. 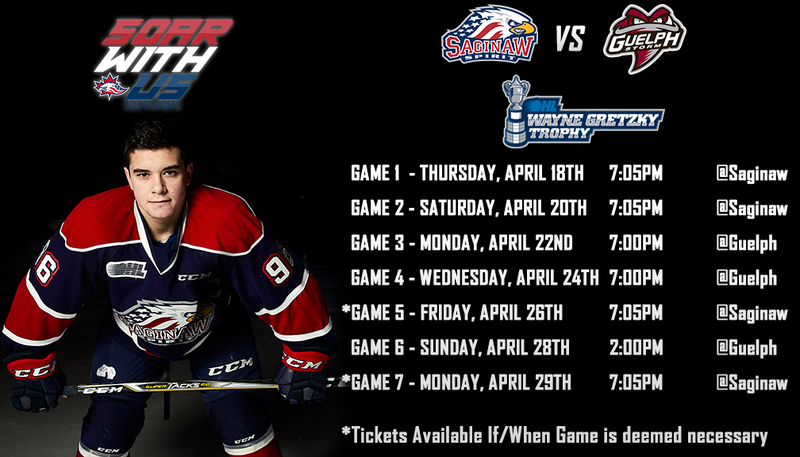 To purchase tickets to any Saginaw Spirit home game call (989) 497-7747, visitwww.saginawspirit.com, or by visiting the Saginaw Spirit Store at 5789 State Street, Saginaw, MI.